Inspirational Musings ఇన్స్పిరేషనల్ మ్యూసింగ్స్: 1651- The peace Prayer Of Saint Francis of Assisi! 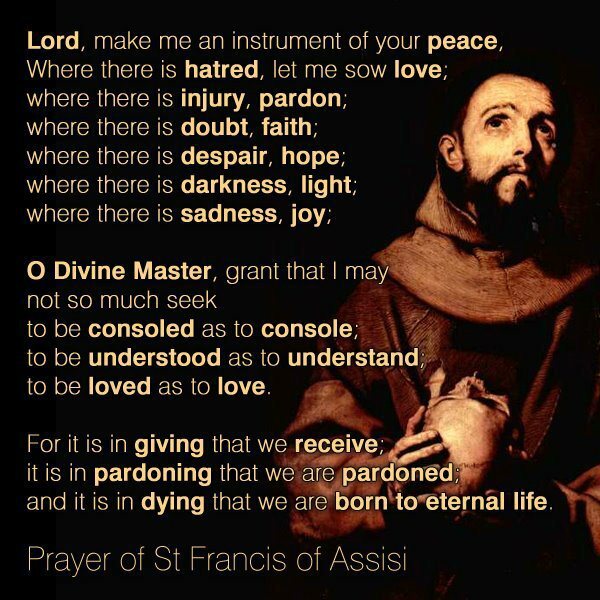 1651- The peace Prayer Of Saint Francis of Assisi! The Prayer of Saint Francis, also known as 'Make Me an Instrument of Your Peace' is a Christian prayer. Widely but erroneously attributed to the THIRTEENTH-CENTURY saint Francis of Assisi. It was very likely inspired by St. Francis's life, and some of his phrases might be reflected in it, but he didn't write it. The prayer had at some point been printed on the back of cards bearing images of St. Francis, hence the confusion. The prayer in its present form cannot be traced back further than 1912, when it was printed in Paris in French, in a small spiritual magazine called La Clochette (The Little Bell), published by La Ligue de la Sainte-Messe (The Holy Mass League). The author's name was not given, although it may have been the founder of La Ligue, Fr. Esther Bouquerel. And it became wildly popular only after it was reprinted in L’Osservatore Romano in 1916 at the behest of Pope Benedict XV, who wanted a prayer for peace in the throes of World War I. A professor at the University of Orleans in France, Dr. Christian Renoux, published a study of the prayer and its history in French in 2001. The prayer has been known in the United States since 1927 when its first known translation in English appeared in January of that year in the Quaker magazine Friends' Intelligencer (Philadelphia),where it was attributed toSt. Francis of Assisi. Cardinal Francis Spellman and Senator Albert W. Hawkes distributed millions of copies of the prayer during and just after World War II. The "Canticle of the Sun", also known as the "Canticle of the Creatures" or "Laudes Creaturarum" ("Praise of the Creatures"), is the religious song composed by Saint Francis of Assisi. It was written in the Umbrian dialect of Italian but has since been translated into many languages. The "Canticle of the Sun" in its praise of God thanks Him for such creations as "Brother Fire" and "Sister Water". It is an affirmation of Francis' personal theology as he often referred to animals as brothers and sisters to Mankind, rejected material accumulation and sensual comforts in favour of "Lady Poverty".